Side pulla bushes have become so popular in recent years and are used by most top match anglers. Their main advantage over a conventional winder bung set-up is that you gain complete control over the tension of the elastic as you are playing the fish. 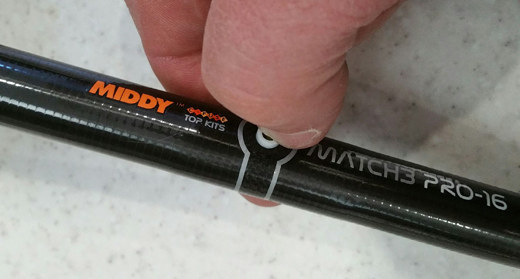 The MIDDY® Pull-It Side Bush is a unique 100% PTFE design and it's the number one recommendation by Pole Fishing Magazine's Alex Bones. Small paint brush or nail brush. 3. 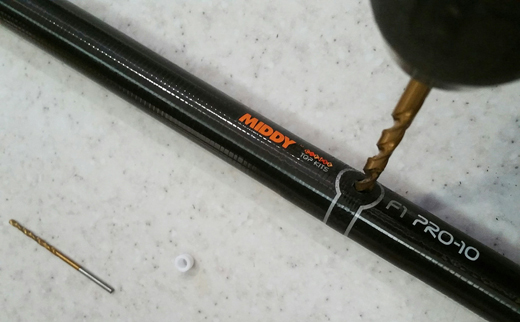 The MIDDY® Pull-It Side Bush is unique with totally smooth critical edges and will simply click into place in the precise 5mm hole you have drilled. 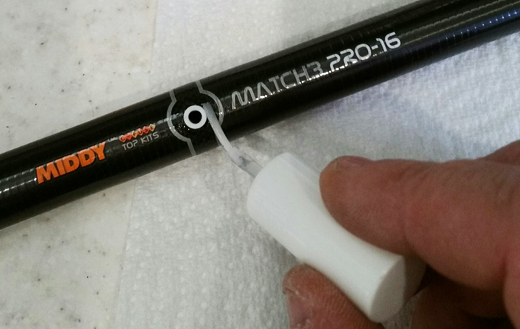 With a little pressure from your thumb, insert the bush until you hear a 'click' and see that it's housed correctly. 4. With your brush, apply the varnish/resin around the outside edge of the pulla bush in a circular motion, making sure you don't get any on the top of the pulla bush. This will allow the elastic to run smoothly. Disclaimer: Drilling and fitting a side puller bush to top-kits is a skilled job. Do not attempt to fit unless you are fully competent and have the correct apparatus. Caution should be taken at all times bearing in mind all safety aspects including wearing goggles. If under 18 years old you should ask a competent adult to carry out the work. If you do not feel confident ask your local tackle retailer. Middy Tackle International Ltd accepts no responsibility for damage or liability you may cause by trying to fit their unique bush or by incorrectly following these instructions.